I don’t know the last time I shared a side dish recipe with you, which is really terrible considering I have hundreds of them pinned to make! I’m spending this month making a lot of recipes that can also be made for Thanksgiving to give you a huge variety to choose from. I made this green beans with a small turkey and mashed potatoes. 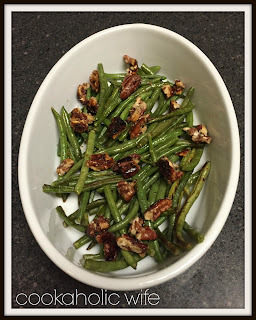 Green beans are probably my go-to vegetable side dish when corn on the cob isn’t available. You can roast them, saute them, even fry them! How can you go wrong there? 1. Preheat the oven to 350. Line a rimmed baking sheet with parchment paper. 2. In a small saucepan, combine the brown sugar, water, cumin and crushed red pepper flakes. Heat over medium heat, stirring constantly until the sugar melts. 3. Remove from the heat and stir in the pecans and rosemary until combined. Spread out in an even layer on the prepared baking sheet. 4. Bake for 6-10 minutes or until the pecans are golden brown and fragrant. 5. Remove from the oven and allow to cool slightly before breaking apart. 6. While the pecans are baking, bring a pot of water to a rolling boil. Add the green beans and cook for 2-3 minutes or until bright green, then transfer immediately to an ice bath to stop the cooking process. 7. Pat the green beans dry. Melt the butter in a medium skillet over medium heat. Add the green beans and saute until heated through, about 4 minutes. Remove from the heat. 8. Sprinkle with salt and pepper and toss to combine with the pecans. Soooo good! 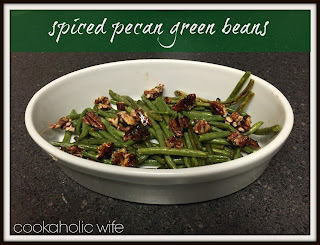 If you were making these for the holidays and didn’t want to spend this much time on one dish, you could easily make the pecan mixture a week in advance. Once the pecans have cooled, transfer them to a sealable bag and keep in the pantry until ready to use. Once blanched, green beans can be frozen or refrigerated for 3-4 days before being cooked. If using from frozen, allow to come to room temperature and pat dry with a paper towel before sauteing in the butter.